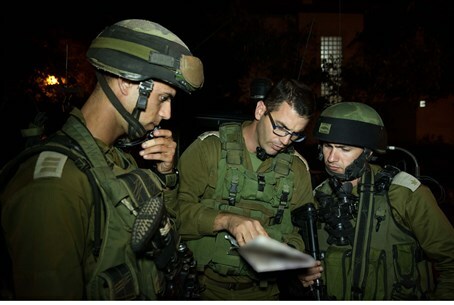 Nearly two weeks after Gilad Sha'ar (16), Naftali Frenkel (16), and Eyal Yifrah (19) were kidnapped by Hamas terrorists, over 15,000 IDF soldiers have conducted nightly raids in the Hevron area, arresting some 360 terrorists in a relatively short time. But while the nights are long and the days can grow tense, soldiers on the ground refuse to have their spirits dampened. "Hundreds of soldiers are crammed into a company's single outpost, and others are sleeping on the ground," a senior Central Command official stated to Walla! News Tuesday. "But no one complains. They understand the magnitude of the task at hand." Every night, combat soldiers raid Hamas villages, towns, and "refugee camps" to arrest terrorists, scan buildings for signs of the kidnapped teens and search for weapons caches. Then, they scan the area for other clues. Despite the hard work, Operation Brothers' Keeper has become one of the most wanted tasks for IDF soldiers. "We get calls from reservists who want to volunteer and help in any way they can to locate the hostages," a senior officer in the Nahal Brigade said. "We have to politely turn them down." While the days are long, IDF officials maintain again and again that progress is being made in the operation. "I personally can see the end of the road," the Nahal officer said. "It's like peeling an onion; you need to do it step by step. We need to take all the proper steps, and in the end, the end will come." "There is no way that this secret, which is known by more than one person, will not be brought to our attention," he added. Officers expected major difficulties encouraging soldiers to keep their motivations high, some of which has eroded slowly by the repetitiveness of searching for the teens, day in and day out, under the scorching summer sun and increasingly complex conditions. "Obviously, it's not easy to maintain the sense of duty," a commander admitted. "But we managed to convey the spirit of the task to the combat soldiers, who understand that these mothers are waiting at home for their sons." "We will do everything we can to bring them back."